I introduce Pliny via Hogarth because The Analysis of Beauty(perhaps not surprisingly for an artist best known as a cartoonist and engraver) is an aesthetic treatise built on what is essentially a philosophy of lines, one concerned—much like the work of Anne Lindberg—with how they operate alone and in concert with one another, one engaged with both their epistemological and ontological status. In what is undoubtedly the best-remembered passage in the book, Hogarth even proposed a kind of linear hierarchy that ranked various types of marks in terms of their fullness of expression. At its apex stood the “line of grace,” a serpentine stroke “which by its twisting so many ways, may be said to in close (tho’ but a single line) varied contents,” a richness of diversity that “cannot be express’d … without the assistance of the imagination.”[iv](It’s this sort of mark that Hogarth, perhaps predictably, imagines the two Greeks must have been employing.) Meanwhile, at the bottom of his roster languished straight lines, which, he wrote curtly, “vary only in length, and therefore are least ornamental.”[v]In Lindberg’s endlessly inventive and elegantly rigorous accounting, however, straight lines—drawn on board in black and colored pencil or in space with delicate, hued filament; lines of minute fineness splitting other lines with exquisite imperfection—are also figures that court imagination, inscriptions that produce dazzling variety, that delineate and enclose an improbably rich catalogue of perceptual and affectual contents. For her, it is the straight line, and a patient, probing exploration of the wide possibilities available within its constraints, that is the path to grace. The fundamental question with any work of art—namely, how to seeit properly—is productively complicated in encounters with Lindberg’s work. Each of the drawn lines, with their variations in color, width, and intensity, is an emphatically discrete artifact—indeed, Lindberg typically begins and ends them before the edge of the surface on which they are made, emphasizing their individuality and handmade contingency. 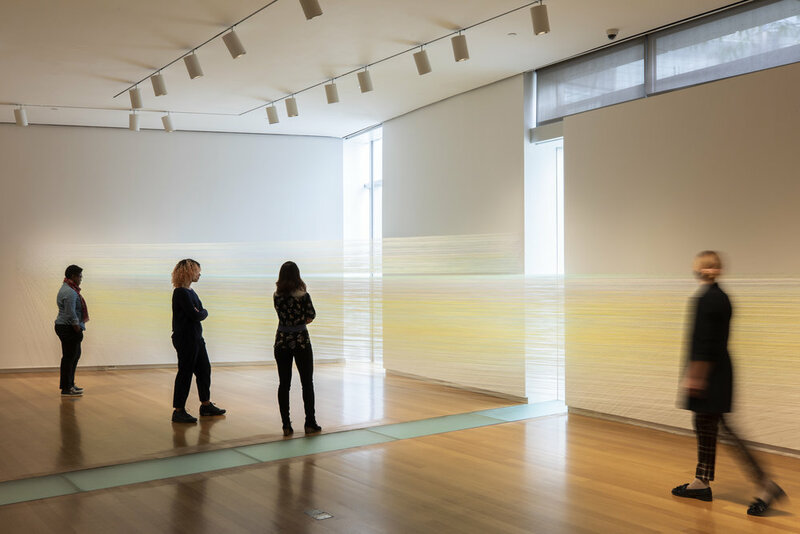 So too does she foreground the mechanics of her spatial weavings, anchoring the threads to the walls at their point of turnaround using staples whose utilitarian physicality is placed into conversation with the mist-like immateriality of the works in their integrated totalities. Are they many things or one thing? Should one concentrate on the individual elements or on the total effect? 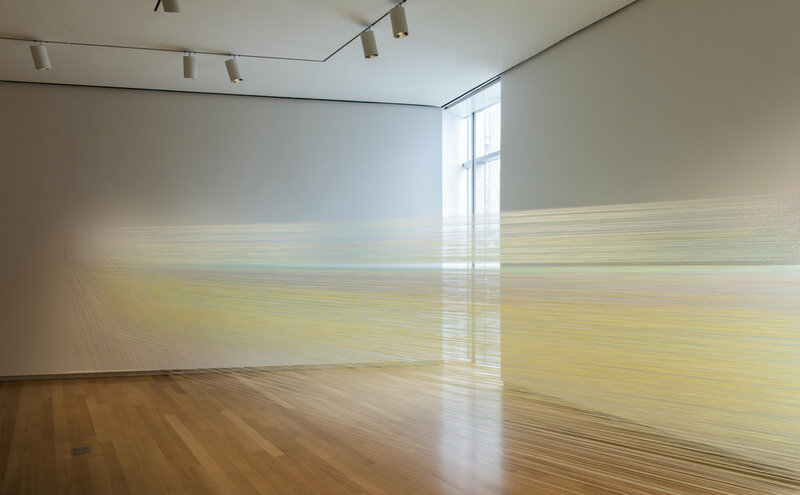 As I have thought with Lindberg’s work these last few weeks, I have often returned to the image of the rainbow—a phenomenon that is dependent entirely on the perspective of the viewer, a concatenation of millions of glancing glints of light that resolves into numinous form at once vividly there and not actually there at all. [viii]It’s fitting perhaps, then, that for the illustration on the frontispiece of the first edition of his book, Hogarth chose to place his line of grace inside what to all appearances would seem to be a prism. [i]William Hogarth, The Analysis of Beauty (London: Printed by J. Reeves for the author, 1753), p. xviii. Emphasis and punctuation in original. [ii]Pliny the Elder, The Natural History, vol. 6, trans. John Bostock and Henry Thomas Riley (London: Henry G. Bohn, 1857). See Book 35, Chapter 36, “Artists Who Painted with the Pencil,” p. 257; spelling modified. The maxim that serves as this essay’s epigraph is said to have been coined in reference to Apelles’s daily devotion to his drawing practice. [iv]Hogarth, op. cit., p. 39. [vi]See Tim Ingold, Lines(London: Routledge Classics, 2016), p. 42 and passim. [vii]Rebecca Solnit, Wanderlust: A History of Walking(New York: Penguin Books, 2000), p. 3. [viii]My thinking on rainbows and looking is indebted to Philip Fisher’s fascinating study, Wonder, The Rainbow, and the Aesthetics of Rare Experiences(Cambridge, MA: Harvard University Press, 1998). On the subjective immateriality of the rainbow, see especially pp. 33-37.